–the use of CSS (Cascading Style Sheets), which my IFTF colleague Mike Liebhold describes as “new very lightweight scripting for agile user interfaces.” These allow users to customize a homepage’s fonts, colors, and so on within a set of 10-20 page templates (pretty much what MySpace MSN Spaces does as far as I can tell). 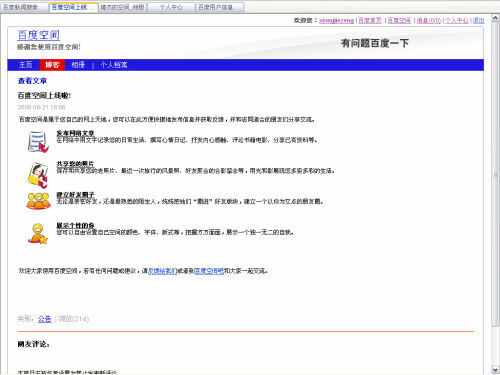 –background music application is not linked to Baidu’s mp3 search bar, or to its Zhangmenren play list sharing site. This seems strange given that some of Baidu’s popularity is driven by youth mp3 searches, which is a distinct advantage over Google. Now imagine this on everyone’s phone. They’ll get there. Update: Catching up on some blog posts, I see that Mao Xianjia at China Tech Stories posted news about what I’m calling BaiduSpace, calling it Hi.Baidu.com. He characterizes it as a personal portal more akin to a Google personal home page or MSN Spaces. Frankly, I don’t know enough about the differences between all of these to be able to say for sure. Web 2.0 stuff feels like a constant mash-up anyway! Given the popularity of MSN Spaces in China, my first inclination on seeing this in the newspaper this morning was to think that they’re playing off of Microsoft’s weblogging/homepage idea, rather than MySpace. Thanks for the input–I will hopefully learn more during my upcoming trip in July/August. BaiduSpace is supposed to launch in mid-July. Next post Shirts for Sale!